The devastating November 13, 2015 terrorist attack in Paris claimed 130 lives around the city -- 89 of them at the Eagles of Death Metal’s Bataclan Theatre concert. Three months later, the band returned to perform for their devoted fans. Directed by Colin Hanks (All Things Must Pass) and produced by Live Nation Productions and Company Name, the documentary spotlights the American rock band as they recount their experiences before and after the tragic events. The film explores the deep bonds between band co-founders Jesse Hughes and Joshua Homme (also a member of Queens of the Stone Age), as well as the intense connection the band has always had with its devoted fans, which moved them to return to Paris to perform once again in February 2016. 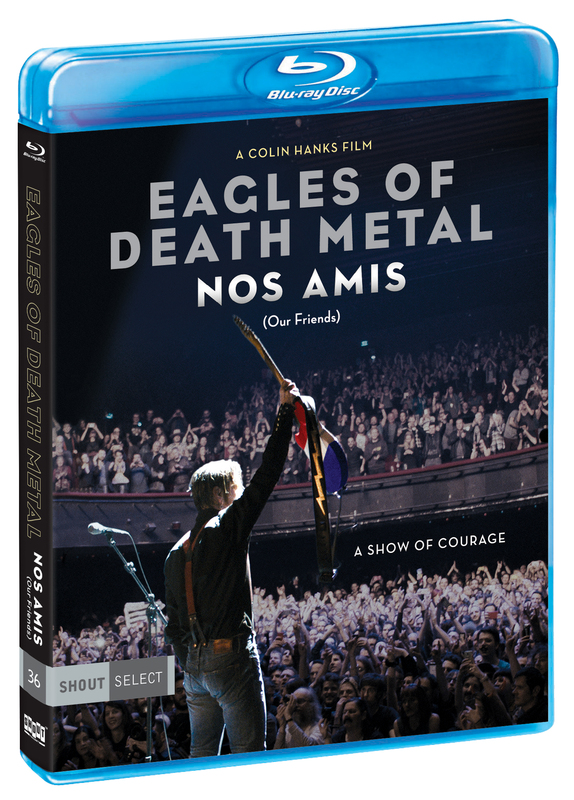 Eagles of Death Metal: Nos Amis (Our Friends) includes accounts of fans who survived the Bataclan attack, extensive behind-the-scenes footage of the band, and interviews with Bono and The Edge of U2. The film serves as a portrait of resilience in the face of unspeakable horror and a life-affirming coda to the events of November 13, 2015. Eagles of Death Metal: Nos Amis (Our Friends) is part of Shout! Factory’s Shout Select line, which exists to shine an extra spotlight on films that truly deserve to be seen.